RasterWeb! 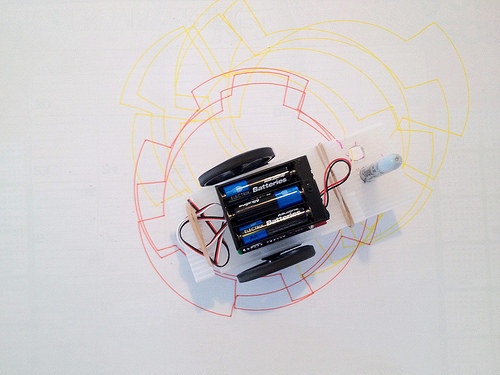 Drawbot at City Hall! Our own little Friday Night Drawbot got invited to City Hall! Milwaukee Makerspace took part in the first Art Jamboree held recently by the fine folks at Art Milwaukee, and while I couldn’t attend, the spunky little Friday Night Drawbot was able to make it, and he did his best to wow the crowd with his take on robotic art. So here’s the deal… join us Friday, March 9th, 2012 at Milwaukee’s City Hall for the Art Jamboree, and if you’re lucky, you’ll walk away with art created by a Sharpie-wielding robot. I’ll be there this time, and I hope to see you there as well. Posted on Sunday, March 4th, 2012 at 1:20 pm. Subscribe to the comments feed. Both comments and pings are currently closed. Post on your own blog.